Stop Nuclear Power Network: Fukushima fuels wave of protests against UK’s "nuclear renaissance"
Fukushima fuels wave of protests against UK’s "nuclear renaissance"
17 March 2011 - As the tragedy at Fukushima Daiichi nuclear power plant in north-east Japan continues to unfold, campaign group Kick Nuclear is joining anti-nuclear activists from around the UK to plan a series of demonstrations and direct action events. "Over the last 60 years, the nuclear industry has proven time and again that it is incapable of controlling such a dangerous – and expensive – form of energy. The government is about to give the green light to new nuclear reactors at up to eight different sites around the UK coastline, and we are urging people to show their opposition before it’s too late." This Sunday, 20th March, Kick Nuclear will support a vigil organised by CND outside Downing Street, London, for the current and future victims of the unfolding disaster at Fukushima and north-east Japan, and to oppose new nuclear build in the UK. 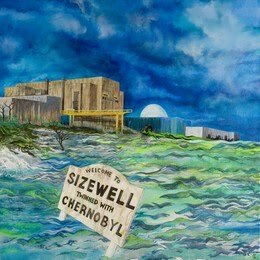 A national rally against new nuclear build will take place outside the gates of Sizewell nuclear power station in Suffolk, England on Saturday 23rd April. A weekend protest camp is to be held on the beach in front of the Sizewell plant from 22nd-25th April, organised by members of the Stop Nuclear Power Network. The camp will coincide with the 25th anniversary of the Chernobyl nuclear disaster. 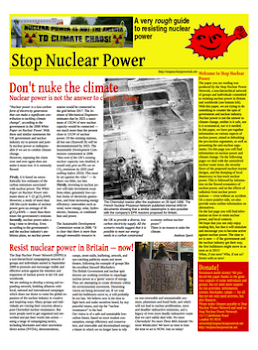 Direct action events are being organised by regional groups at various nuclear power plants around the UK. Campaigners in Somerset are gearing up to make Hinkley Point the new environmental front line of protest. 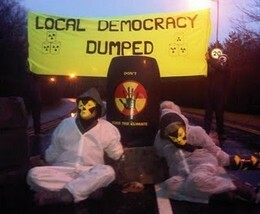 Kick Nuclear is reinforcing its campaign for a national boycott of EDF Energy. The French state-owned energy giant is spearheading the push for new nuclear build in the UK, and elsewhere. "Even prior to Fukushima, there have been at least four near-catastrophes at nuclear power plants around the world in the last 10 years, (1) and many other cases where radioactive waste has been allowed to leak into the UK’s water supplies and food chain (2). "It may be unlikely that a high-level earthquake will affect the UK, but there are plenty of other risk factors. Floods, storm surges, acts of terrorism and human error can never be ruled out. Nuclear energy has no place in the twenty-first century." "Last December, nuclear reactors in the UK’s ageing fleet were granted lifetime extensions of between five and twenty years. The technology in these reactors is out of date and safety breaches are commonplace. The only way the public can be reassured is if the inspections are carried out by a completely independent panel of experts, and not the usual government suspects." 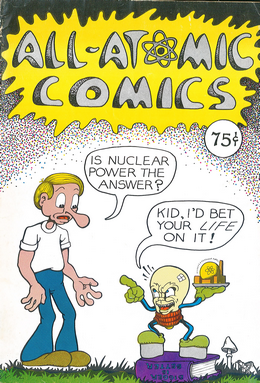 Kick Nuclear maintains that the public has been duped into thinking that new nuclear is necessary to combat climate change. Andreas adds: "New nuclear power will offer too little, too late. There are many alternatives that do not carry such a high price in terms of safety and cost. 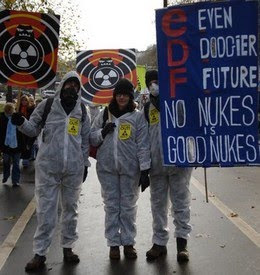 The government must abandon its plans for a new generation of nuclear power stations." (1) Since 2000, there have been near-disasters at nuclear reactors in Sweden(1), the Netherlands(2), Japan(3) and France(4). April 2010: Sellafield nuclear processing facility exposed for dumping five bags of radioactive waste in a landfill site after a faulty scanner passed them as safe. March 2010: Sizewell B shut down for seven months following failure of a pressuriser in the primary cooling circuit. In its report, the Nuclear Installations Inspectorate says that it is likely that other pressurisers pose a risk too, but still allowed Sizewell B to restart. March 2010: nuclear power station operator, Magnox, fined £250,000 for allowing 14 years of radioactive leaks from a holding tank at Bradwell nuclear power station in Essex. January 2007: cooling water from the spent fuel pond of Sizewell A leaked into the North Sea. This was only noticed by accident. "I do not believe a single word that issues from the mouth of a single spokesperson for the nuclear industry." - Jonathon Porritt addressing a Stop Hinkley meeting May 2010.